If you need instructions on two-layer-warping (2LW), please see instructions in the posts linked below. 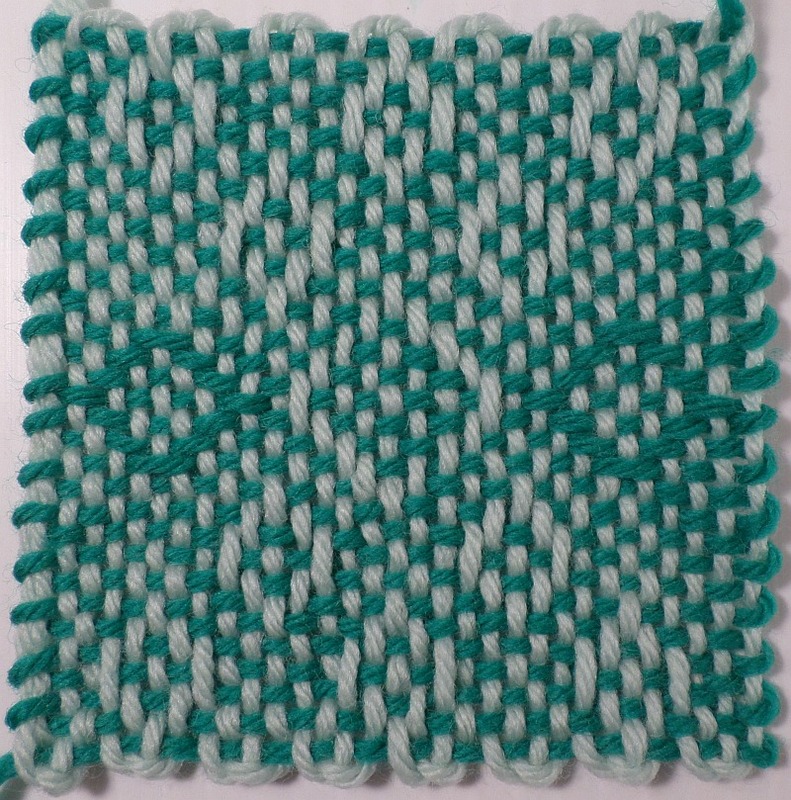 The first post tells how to warp the loom and weave Row 1. The second post shows the needle path (where to enter and exit the loom) for the first eight rows of a 2LW pattern. For this pattern, follow the diagram below, but follow the needle path instructions; they are universal for all 2LW patterns. “Multi-Diamonds 4” features diamonds created by going Over and Under on front and back. Explanation of colors: pink squares are Under stitches, red squares are also Under; blue squares are Over stitches; white stitches are also Over (P). Hola Sue,me encantan tus diseños y trato de practicarlos este me gusto pero no lo puedo realizar no me doy idea para ponerlo en practica,de ser posible te pido si podes explicarme como se hace, muchas gracias por compartir tu creatividad. Ines. 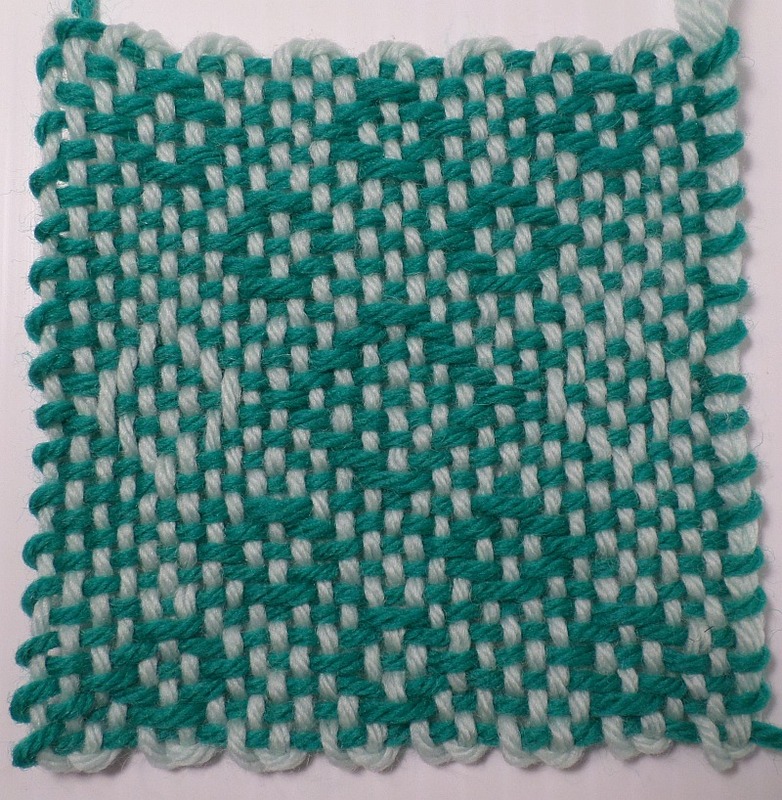 Please follow instructions for the yellow square–using 2-Layer Warping (2LW). After you warp the loom, scroll down to the instructions for weaving the first row–the sample has dark purple and light purple yarn. You will need to follow the diagram above for the pattern stitches, but follow the Part 2 blog post for instructions on where the needle goes. If that is too difficult, I can write out the instructions for you. Please contact me again if you need more photos with instructions. I want the blog to be useful for people who don’t speak English, but sometimes I forget about that when I’m writing it. Thank you for contacting me.